THE residents of 122 villages straddling Chilika lake in Orissa have been fishing in troubled waters for the past two decades. Ironically, the draft Bill - cleared by the state cabinet in December 2001 - to provide succour to them has sent their hackles rising. The legislation, when enacted, will seek to restore the ecology of Asia's largest brackish-water lake by imposing a blanket ban on scientific prawn culture inside it. The protesting fishing community feels that the proposed law is not stringent enough to keep the prawn mafia and non-traditional fish workers at bay. It is apprehended that these groups would continue to encroach on the fisherfolk's territory, in effect leaving the long-standing dispute between them unresolved. The contentious clause in the Orissa Fishing in Chilika Regulation Bill, 2001, (see box: Law and lacunae) deals with empowering the state government to sub-lease 14,000 hectares (ha) - out of 47,000 ha fishing area in the lake - to non-traditional fisherfolk. "We (fisherfolk) had been urging the government to frame such a law but it is a complete let-down," says Raghunath Jali, general secretary, Orissa Matsyajibi Union. "The state government has overlooked our traditional rights and is set to lease out areas to others," laments Anadi Behera, secretary, Chilika Matsyajibi Mahasangha, a cooperative society. Manoj Pradhan, editor of the State of the Environment report for Orissa that has been prepared by non-governmental organisation Council for Professional Social Workers (CPSW), concurs: "The rights over the 14,000 ha given to non-traditional fisherfolk will give a fillip to the thriving prawn mafia." But the authorities differ. 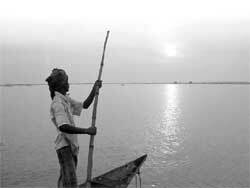 The regulation will free Chilika from the clutches of the illegal operators, asserts a state government spokesperson. Lake lustre Ecologically, Chilika boasts a wealth of flora and fauna: it is home to 158 species of fish, two types of crab and 165 species of birds. Apart from this, there are 706 species of flowering plants in the region. For all its nature's bounty, Chilika hit the headlines only in 1981 when M G Rao - then assistant director of fisheries - introduced tiger prawns into ponds given to fisherfolk (see Down To Earth, Vol 1, No 7, August 31, 1992). Though the prawn farming experiment succeeded, the area has been in the news for all the wrong reasons ever since. The lagoon is shrinking by two square kilometres a year due to silting caused by deforestation in the lake's catchment area. Worse, gheris (fenced enclosures for prawn farming) erected by non-traditional fisherfolk obstruct the outflow of silt into the sea. What has set the alarm bells ringing is the fact that the lake has been included in the 'Red List' of the Ramsar Convention, indicating its virtual extinction. This is reflected in the fish yield that has plummeted by one-third in the past 20 years. Despite this the control of the state and private business interests over natural resources in the region has grown, further impoverishing the poor fisherfolk. The bumper prawn harvest in the early eighties attracted several powerful non-traditional fish workers and the mafia. Even the business house, Tatas, had set up shop in the area. But it was forced to withdraw by the fishing community. The fisherfolk formed 38 cooperative societies and demanded land rights. When they were offered only a lease agreement, they moved the High Court. An unfavourable verdict saw them filing an appeal in the Supreme Court (SC). The SC laid down guidelines for eviction of illegal gheris from the lake and upheld the claim of the fisherfolk over Chilika. But official inaction led the fisherfolk to demolish gheris themselves. A flashpoint was reached in May 1999 when four fisherfolk died in police firing. The yet-to-be-passed Bill is merely a cosmetic exercise by the state government so that it is seen to be implementing the SC directive, says Jali and adds that the very provision of leasing out 30 per cent of the area to non-traditional fisherfolk smacks of subterfuge. In fact, this would give the prawn mafia an ideal alibi to consolidate their holdings here, he contends. Another loophole in the proposed law is the continuance of the three-star system of cooperatives borrowed from neighbouring states. "Earlier, we used to get the lease from our central cooperative society. Now the Orissa State Fishermen's Cooperative Federation has sprung up as a bottleneck," alleges Sadasiba Jena, chief advisor, Purbanchala Matsyajibi Mahasangha. However, Ajit Pattnaik, chief executive officer of the Chilika Development Authority, is confident that the regulation will help weed out criminal elements. "Now that we are armed with more powers and there is a provision for penalties, we will get tough," he says. "The identification of ecosensitive zones and the tabling of the environmental impact assessment report in the state assembly are welcome measures," adds Pattnaik. When the state cabinet gave the go-ahead to the Bill, fisherfolk took to the streets in Bhubaneswar and submitted a memorandum to Orissa chief minister Naveen Patnaik. Unfortunately, the safeguard that was supposed to curb the shrunk and shrivelled lake's unregulated exploitation had a ripple effect of a different kind: it sparked a series of protests that are likely to snowball into a major agitation. In the process, the bitter rivalry to grab a slice of the Chilika pie is set to intensify - at the cost of the ecology of the region.